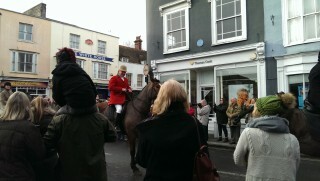 A huntsman on a horse rides up Silver Street towards the Blue Boar pub. I positioned myself on the corner of the High Street and Silver Street amongst the many members of the public here to watch. They seem to be mainly divided by pro (this side of the street) and anti (that side of the street). As the horses and hounds approached, the protesters try to block the road and shout their disapproval, whilst the supporters cheer, whistle and clap, both groups trying to be louder than the other. Eventually a man on a big horse pushes through and sounds his horn. 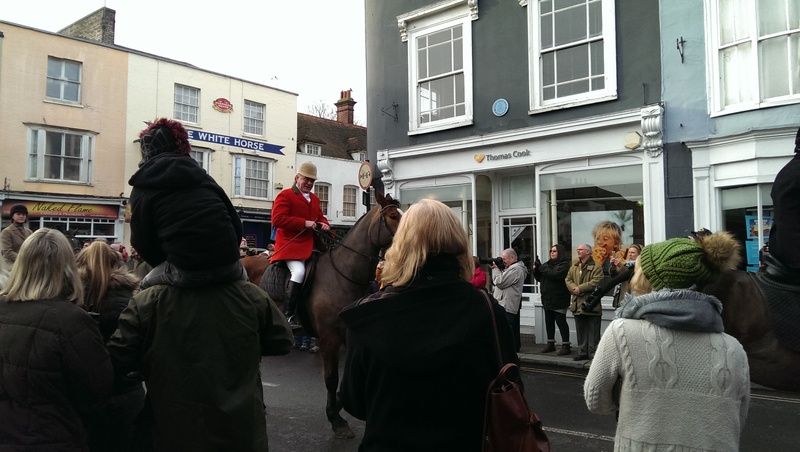 The hounds and horses follow and all file into the Blue Boar Pub, followed by the crowd.